Supplier relations are impacted by requisite AP customer service to answer questions, maintain high data quality and address problems. Vendors, in order to manage their own cash and working capital needs, often contact via phone and email, either the person in the organization who directly purchased the goods, or AP, to determine the status of invoice receipt, approval or payment. Researching and responding to vendor and internal inquiries increases processing cost per invoice and takes staff away from other responsibilities. In addition, the interruption of taking the staff member away from what they were doing may increase invoice-processing errors. If the caller is upset that an invoice has not been paid and is unpleasant and demanding, morale and hence, productivity, may suffer. Inquiries from vendors and internal customers can be distracting to your AP team and can be costly. 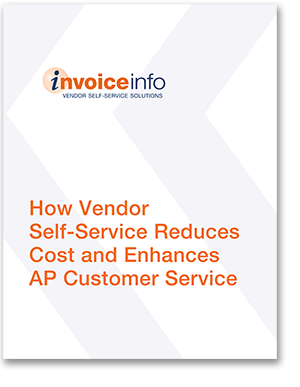 As the world continues embracing self-service on the Internet, vendor self-service can be a timely fit; it’s appreciated and becoming expected since it helps both AP and vendors save time and enjoy improved service at reduced cost — a win-win!